Abstract: The Frederick Sandford "Sandy" Phillips Papers contain materials related to "Sandy" Phillips, one of the 35 Syracuse University students killed in the bombing of Pan Am Flight 103 over Lockerbie, Scotland. Materials include clippings, writings, audio recordings, and photographs. Frederick Sandford "Sandy" Phillips, born May 8, 1961 in Fayetteville, Arkansas, was a student at Syracuse University's School of Management. Sandy, also affectionately known as "The Sandman," had returned to his academic studies at age 27, after several years of working in the business world. After just one year on campus, Sandy was elected Administrative Vice President of the Student Government Association (SGA). He was a talented musician, athlete, and poet, whose gifts live on through his friends, family, and poetry. Sandy was survived by his mother, Caroline Stevenson; his father and stepmother, Chester Phillips and Mary Cockrill; two brothers, Clark and Douglas; and a stepsister, Lila Pearsall. 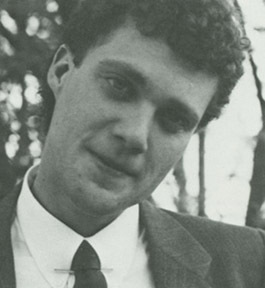 The Frederick Sandford "Sandy" Phillips Papers contain materials related to "Sandy" Phillips, one of the 35 Syracuse University students killed in the bombing of Pan Am Flight 103 over Lockerbie, Scotland. Materials include series for Audiovisual materials, including a recording of Sandy's goodbye phone message; Clippings, primarily from December 1988; Memorabilia; a Scrapbook of Sandy's life compiled by his mother, and duplicated for this collection; and Sandy's Writings, containing two copies of YOU's: A Collection of Poetry. Selected materials from this collection may be available digitally. Please contact the archivist for further information on accessing the materials. YOU's: A Collection of Poetry. The Frederick Sandford "Sandy" Phillips Papers were donated by his mother, Caroline Stevenson, in 2009. The Frederick Sandford "Sandy" Phillips Papers are fully processed. Materials have been removed from original binders, and re-housed in archival folders. Clippings have been photocopied for preservation purposes. This collection remains in its original order.